Nazraeli Press, Portland, 2011. 136 pp., 81 duotone illustrations, 12x13". In the summer of 2004, Richard Rothman traveled west with a 4x5 camera to explore the remaining fragments of ancient old-growth forests in Northern California. He pitched a tent amid the mammoth stands of redwoods and began making formal, intricate portraits of the forest, which he describes as “the most visually stimulating environment I had ever been in.” Unexpectedly, he also began developing an interest in the neighboring town of Crescent City, an economically depressed logging and fishing community. Rothman was affected by the town’s architecture, its emotional tenor, its political and religious culture, and the sometimes unconscious relationship that the townspeople had with the corralled forest to the east and the Pacific Ocean, which represents the end of the Western frontier. The contrast between the radical, spectacularly ornate environment of the forest and the trashed, disposable landscape of the town that abutted it became the subject of a more complex project which would take some surprising twists and turns. 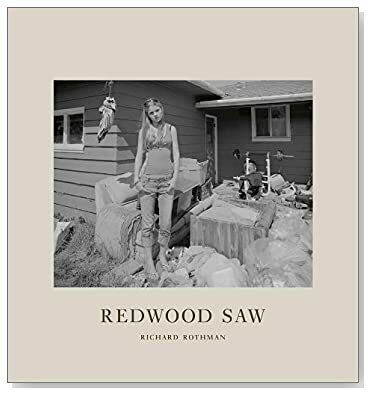 The body of work, made over a five-year period, is gathered together in the artist’s monumental first book, Redwood Saw. 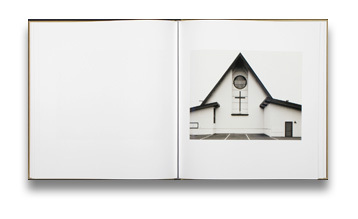 This stunning monograph is an ambitious attempt to represent the culture, people, and landscape of Crescent City, and, by extension, the current American moment. Crescent City—a place that at one time must have seemed to possess an almost limitless abundance of natural resources—is revealed here as a compelling and dramatic model of a former boom town that staked its future on what can only be described as an “unsustainable cultural and economic reality.” Beautifully printed in duotone on matt art paper, this first printing of Redwood Saw is limited to 1,500 casebound copies. Richard Rothman’s work is in the permanent collections of the Museum of Modern Art, New York; the International Center of Photography, New York; the Bibliothèque Nationale de France, Paris; the Brooklyn Museum; and the Center for Creative Photography at the University of Arizona, Tucson. This special edition of Redwood Saw is available in 2 versions. Each is limited to 25 copies and includes an original print, numbered and signed by the artist and presented in a clamshell box. View print choice 1 (TREE) and print choice 2 (EAGLE). Read Adam Bell’s review of Redwood Saw in photo-eye Magazine. TR367-LTD Limited Edition is no longer available.